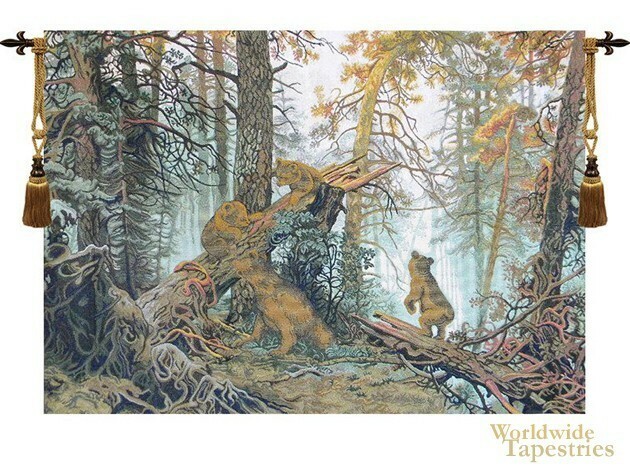 This exceptionally delightful tapestry "Morning in Pinewood" shows a scene of forest bears, the work of artist Ivan Shishkin from 1889. Shiskin was a Russian landscape painter who hailed from the Saint Peterburg Imperial Academy of Arts where he graduated with a gold medal. His works are highly regarded and his most famous works are those of forest landscapes. Though from Russia, he lived and worked in Switzerland and Germany for many years to grow his experience and to draw inspiration from more sources. In this piece, we see a delightful scene where four bears are playing with the broken branches of a tall oak tree among the beautiful forests. We see the exquisitely detailed branches and foliage in this Russian verdure. The interplay of colors is gorgeous with its browns, grey greens and the more sunny golden browns of the illuminated trees and the bears. This wildlife tapestry "Morning in Pinewood" is backed with a lining and has a tunnel for easy hanging. Note: tapestry rod and tassels, where pictured, are purchased separately. Dimensions: W 32" x H 24"
Dimensions: W 63" x H 48"